If disrupted sleep rules your nights, it can make your days nightmarish. You may feel sluggish, groggy and dull. Your emotional and physical health may suffer. Nutrition plays a role in how well you sleep. Food relates directly to serotonin, a key hormone that — along with Vitamin B6, B12, and folic acid — helps promote healthy sleep. Try to consume foods that calm the body, increase serotonin levels and get you ready for restful sleep. These include complex carbohydrates such as whole grain breads and pasta; lean proteins such as chicken or turkey; heart-healthy fats such as walnuts, cashews and pistachios; and beverages such as warm milk or chamomile tea. If you’re tempted to use an over-the-counter sleep aid to get some rest, there are a few good guidelines to keep in mind. Allow enough time for a full night’s sleep. Don’t try them the night before a big, event-filled day. Watch for side effects. And only use sleeping aids for short periods of time. 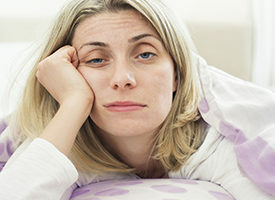 Ongoing insomnia? Talk to your doctor. If you like to take a nap every day, try limiting them to 10 or 15 minutes. That makes it easier to hit the ground running when you wake up. Napping too long or too often can have a negative effect on sleep patterns and cause sleep inertia, which is the feeling of grogginess or disorientation we experience after waking from a deep sleep. Working non-traditional shifts interferes with your body’s internal clock and can result in sleep trouble. Attack the problem by following a regular bedtime routine and making your environment conducive to sleep by keeping your bedroom dark, cool and quiet. Go to bed immediately after work and let people know what hours you work and when you will be sleeping, so they know when to leave you alone. That nightcap before bed may help you fall asleep easily. But it can end up robbing you of a good night’s rest. As the alcohol is metabolized during the second half of the night, it creates more fragmented sleep. This can mean vivid dreams, sleepwalking, nightmares and even breathing problems because alcohol relaxes your muscles. It’s best to limit drinks in the late evening or eliminate them entirely.